Chocolate creme brulee: an impressive dessert that’s so simple to make. Just a handful of simple ingredients and you’ll be in chocolate heaven! Good Tuesday morning! I hope your week is off to a good start. But, if not, then maybe I should offer you some chocolate. Chocolate creme brulee, to be exact. Doesn’t it sound so fancy? With the French name? Truth is, it’s one of the easiest desserts you’ll ever make. I had a little bit of a scheduling snafu this week and I realized I didn’t have a post for today. This all happened yesterday morning. Right as I was planning and packing for a 4-day trip. Oh dang! I needed something in a hurry. Preferably something super-quick to make, because I didn’t have a lot of time to mess around. 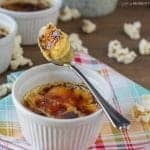 Creme brulee to the rescue! 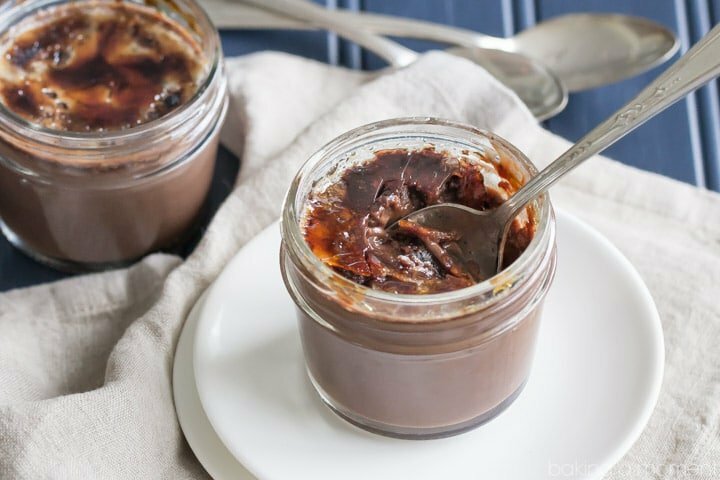 Chocolate creme brulee is a great make-ahead dessert for those times when you feel like there just aren’t enough hours in the day. And it’s made from stuff you probably already have on hand. Eggs, sugar, cocoa, cream, chocolate… that plus a pinch of salt and a splash of vanilla. That’s all you need! Start by stirring the egg yolks together with the sugar and a little cocoa powder. I prefer regular unsweetened cocoa powder for this, but you could also substitute dark, aka Dutch processed. It’s purely a matter of taste! Once you have all that combined, just heat the cream on the stove until steamy, and stir in the chocolate until it’s melty and delicious. Then slowly stream the hot chocolate/cream into the egg mixture while whisking. Add the vanilla and transfer it to ramekins or little jars. I love to use 4-ounce mason jars because they’re SO cute, oven-safe, and they come with a lid! 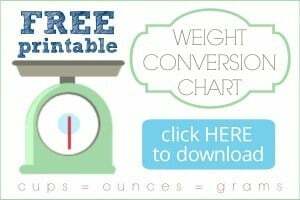 Here’s a link to the kind I’ve used here. Once it’s all portioned out, just place the little dishes in a larger baking dish and pour hot water all around. This is called a water bath or a bain Marie. It helps to heat the custards more gently so they come out creamy and smooth. Bake until set around the edges and just a little bit jiggly towards the center. In my oven this takes about 30 minutes, but I’d suggest checking after 25. Not all ovens are exactly the same, so yours could be done sooner. Or they could take a bit longer. Just keep your eye on it and see. 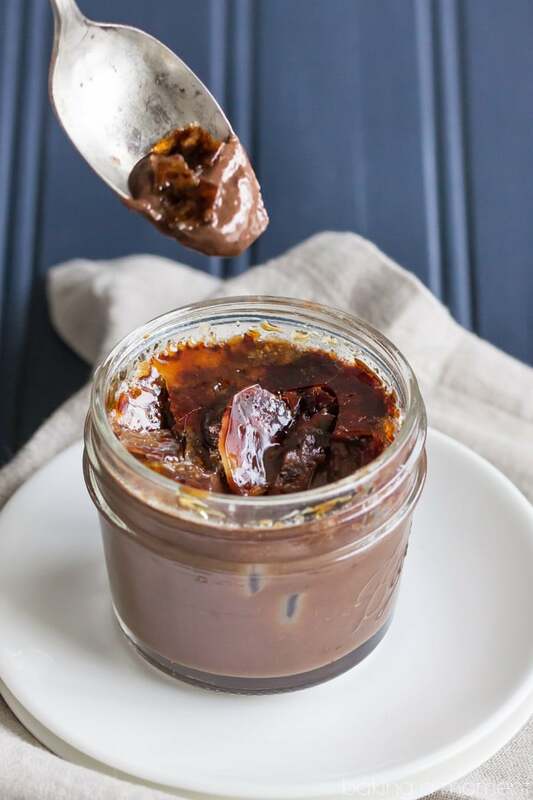 Right before you’re ready to serve, just top the chocolate creme brulee with a little bit of sugar, and broil it until it’s crunchy-caramelized. You can do this under the broiler of your oven, or use a brulee torch. The brulee torch is great because it’s so exact. Plus it’s fun to use! 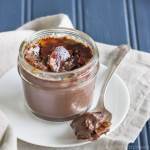 Crack the caramelized sugar layer with your spoon, to reveal the lush, creamy chocolate custard below. Chocolate and caramel are such a classic flavor combination, and the contrast in textures is just incredible! Chocolate creme brulee is sure to make your day! Chocolate creme brulee: an impressive dessert that's so simple to make. Just a handful of simple ingredients and you'll be in chocolate heaven! Place the yolks in a mixing bowl, along with the sugar, cocoa, and salt. Whisk together until combined. Heat the cream in a small pot until steaming. Whisk in the chocolate until melted and smooth. Slowly add the hot cream/chocolate to the egg yolk mixture, while whisking. Bake for 25 to 35 minutes, or until just barely set in the middle. Cool completely, then top each ramekin with additional sugar and brulee with a torch or under the broiler. Serve immediately. To make ahead: Cook the custards up to 2 days ahead, and keep refrigerated. Top with sugar and brulee just before serving. That sugar crackle on top – I’m dying over it. These are so pretty. These are such a lovely dessert, and they look so silky and luscious! Definitely just brightened up my Tuesday. Have a good trip!! I’m so glad these could brighten your day! Thank you so much for the sweet compliments Sarah! Oh gosh, I take chocolate seriously…and this creme brulee is to die for! Hope you make extra for your post trip dessert. I don’t make creme brulee often enough! 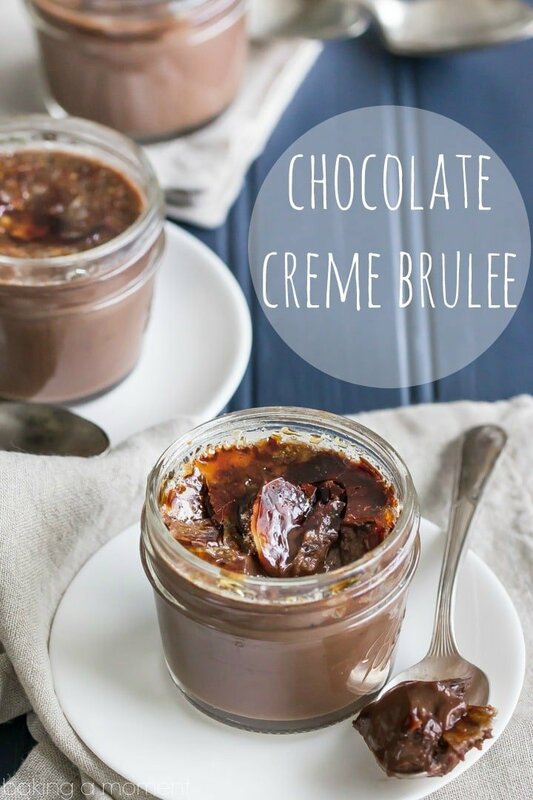 I think my weekend needs this chocolate creme brulee! Yes! Do it Jessica! It’s so easy to make and would be perfect after Sunday supper. Hope you’re enjoying your weekend! I’m so happy you like it Hannah! I love the classic version, but I could never say that adding chocolate to anything is ever a bad thing! Thanks so much for the great feedback! 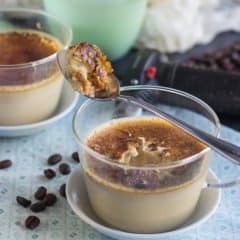 I love creme brulee and I’ve never had a chocolate version before! This must be remedied! Oh yes, asap! Hope you love it, Kayle! It looks like the best dessert ever! I would love to make for an event. Could i torch the top and serve an hour later? How long can they sit out on dessert table? Hey Linda! You might be able to get away with an hour, but I probably wouldn’t push it too much longer than that. After a while the bruleed sugar starts to lose its crunch, and gets sticky/chewy. Good luck! 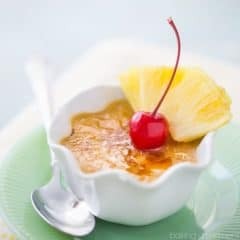 We love creme brulee at our house, one of our go to celebration desserts. Love this chocolate version! 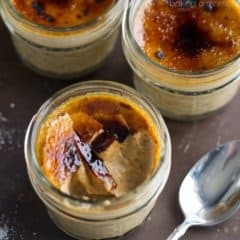 Your creme brûlée looks so perfectly creamy!